South Korean actor, Song Seung Hun (송승헌) attended the press conference of MBC drama, 'When A Man Is In Love (남자가 사랑할 때)' held on March 27, 2013. The main lead of the drama wore a leopard print top from Saint Laurent Spring/Summer 2013 menswear collection with a pair of black trousers and black coat. 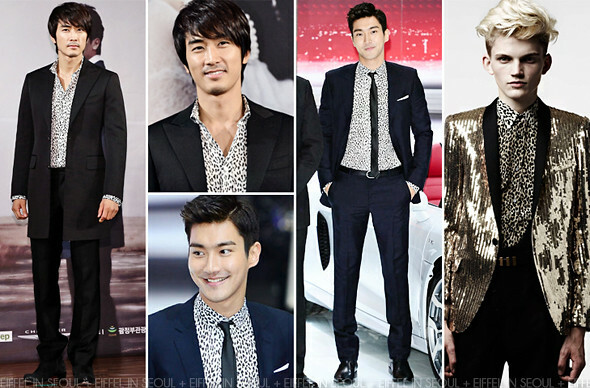 Choi Si Won (최시원) from was seen wearing the leopard print top with a blue suit and skinny black tie at 2013 Seoul Motor Show held at Korea International Exhibition Center in Ilsan, South Korea on March 28, 2013. While Song Seung Hun (송승헌) rugged look certainly align with his character in the first episode of the drama, I love a clean and sleek look. Thus, Choi Si Won (최시원) wins for me.